The FT-201P is a 10/100/1000 Base-T to 1000Based-SX/LX (SC/LC) GbE media converter, which allows two types of network segments to be connected easily and inexpensively. 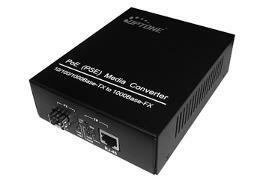 The converter includes a PD signature sensing and power monitoring features. Other features include over-current protection, under-current detection and fault protection input. The LFP (Link Fault Pass-through) allows the media converter to monitor both the fiber and copper RX ports for loss of signal. In case of a loss of RX signal on one media port, the converter will automatically disable the TX signal to the other media port, then passing through the link fault. FEF (Far End Fault) enables the converter to stop sending link pulse to the link partner once a loss of the fiber RX signal is encountered. Then the link partner will synchronously stop sending data. FEF prevents loss of valuable data transmitted over invalid link. Combining LFP and FEF troubleshooting features of PSGC-110A, both end devices can be notified of a loss of fiber link.